If you’re stressed by a business conflict, you’re probably “taking your work home with you” and thinking about disagreements and arguments even when you’re off the clock. Worrying may even feel “normal” to you by now, but let me assure you, it is not normal. Feeling tense about engagements with coworkers will drastically hurt your productivity at work, and may result in disciplinary action taken against you, even if you’ve done nothing technically “wrong”. You don’t deserve this. I know you don’t. How do I know that? Because you’re here, on this page, looking for a solution to your problem. I applaud you for taking this first crucial step. You see that having the knowledge of proper conflict resolution can greatly improve your life. Knowing how to quickly and easily squash conflict can rid you of anxiety, frustration, fear, stress, and all other agitations that conflict brings into your life. Perhaps you’re an executive who knows that improved harmony in the workplace will lead to greater success and a higher bottom line. Understanding effective communication techniques and conflict resolution methods are the keys to enhancing your employees’ dedication and improving their performances. The solutions you’re looking for are right here on this page, and I’m excited to share them with you. I need to remind you that worrying about conflict is not normal. Each day, those who are armed with the tools to stop workplace conflict dead in its tracks go home with peace of mind and the ability to focus on the things that really matter: family, friends, self-improvement and personal enjoyment. Would you like to be one of those people who goes home from work and actually stops thinking about work, and workplace relations? Would you like to walk in the door and be fully “tuned in” to your family’s warm welcome? To pay crystal clear attention to what your spouse and children tell you about their days, instead of being distracted by your own workplace issues? That’s the beauty of knowing how to solve business conflicts. It instantly improves not only your hours spent at work, but your hours spent at home. Each facet of your life glows brighter and makes you happier when you have the tools that you’ll access today. In fact, as you continue to read this information, we’ll begin to reduce the stress you feel from conflicts in your life. There is no need or reason to wait. I’m going to show you how to start solving conflict right now. But before we get into that, you probably want to know who I am, and how I can guarantee that I’ll show you exactly how to solve conflict and rid yourself from the unnecessary stress conflict causes. My name is Paul Endress, and for over 30 years I’ve developed and honed my interpersonal skills to become a sought after human interaction expert. I’ve started 9 companies and have had thousands of employees answer to me. From that alone, I quickly learned how important it is to communicate effectively in order to create a harmonious work environment for both myself and my employees. It is only in such an environment that one can be sure the company is maximizing its potential in all terms: profitability, efficiency, human relations, and subscription to corporate values. But my experience with conflict resolution only begins there. A genuine obsession with what makes people “do what they do” led to countless hours studying psychology, linguistics, and attending seminars. I’ve even been so lucky as to study under Richard Bandler himself, the creator of NLP (Neuro Linguistic Programming, if you don’t know what that is, I’m excited to tell you more about it because it is going to be a game-changer for you). You may have read my commentaries on conflict resolution in publications such as Forbes, USA Today, Entrepreneur, and the New York Times. What sets me apart from other conflict resolution and self-help gurus? My experience comes from real life. Over the past 7 years I have worked with tens of thousands of people to help them resolve conflict, improve their communication skills, and change their lives for the better. I did this in my own businesses and in workshops and seminars where those struggling with conflict would seek out my help. Fortune 500 companies such as Hess Oil Corporation and Lockheed Martin have invited me to personally speak to their employees and run workshops designed to minimize and eliminate conflict within the workplace. These workshops are always a great success, enjoyed by executives and employees alike. Now, let me start to create the same transformation that Michael experienced, for you. I’d like to ask you some questions about your communication techniques. More often than not, making simple changes in how you communicate with others will stop conflict, or prevent it entirely. Take a second out to seriously consider these questions, as they’ll shed light on why you may have some of the issues you currently do. 1. When you’re in a conflict situation, do you try to avoid the issues or other party, or do you engage? 2. If you engage, do you try your hardest to present your viewpoint? Or do you take the time to truly understand the other party’s position? See how thinking about the way you communicate can be incredibly powerful? As you’ve probably guessed, if you’re concentrating your efforts on getting your point across, and not on listening to others, you’ll never “win the battle” of communication. It is only after you understand the “what” and “why” behind other peoples’ views that you’ll be able to aptly convey your message, come to an agreement, and resolve conflict. I’m going to show you exactly how to quickly and easily get to the “what” and “why,” and how to use this knowledge to your advantage and to the advantage of your company. 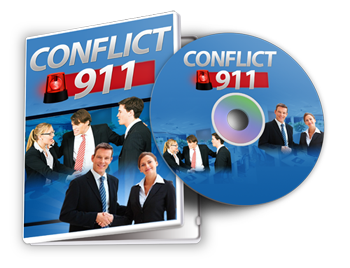 The Conflict Resolution Power Package contains everything you need in order to quickly and fully understand the nature of conflict, how to communicate effectively, how to squash existing conflict, and how to prevent conflict from hindering your business life. In turn, your pride and productivity in your job will skyrocket, your personal life will improve thanks to the lack of work-related stresses, and you’ll be left feeling free and confident in your ability to interact with anyone, regardless of how negative or difficult they may seem. In fact, let me share the one simple phrase you should ask yourself when dealing with someone you consider negative, right now. If you feel as though someone in your workplace is acting out against you, or if something a coworker does or says rubs you in the wrong way, there is a simple and effective solution. You’ll immediately find other potential reasons for the behavior you didn’t like, many of which will have nothing to do with you. For example, during a telephone consultation a client told me that whenever a co-worker looked at her a certail way it really set her off. I taught her to ask the question "what else could this mean?" and her problem was solved. You can listen in to the actual session right here. Just wanted to thank you again for the class. I have had some of this training in prior courses and kind of "know" some of the other topics discussed but I have never seen it all in one place. I also appreciate the way the material was taught - usually the instructor is just a facilitator who doesn't actually "live" the material as you do. Thanks again! 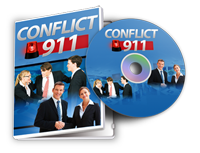 Instant & Unlimited Access to Conflict 911 – An online video course that will solve all of your business conflict problems, guaranteed. The Communication Cycle that each message we send and receive goes through and how “errors” that lead to conflict can infiltrate their way into each part of the cycle. Knowing this is crucial to communicating effectively, and you’ll uncover the easy way to verify that the message your listener receives is the same one you send. 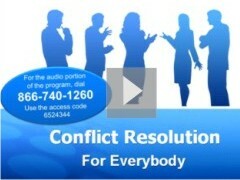 This virtually eliminates all tension and conflict in your communications. An Unknown Ally. A lot of the time, people DO agree with you, they just don’t know it yet. You’ll learn exactly how to get others to realize that they’ve agreed with you all along. Roots Of Behavior. While most people see and to some extent, understand behaviors (like yelling, bad-mouthing, etc. ), attempting to deal with behaviors will never fully solve a conflict problem. You’ll discover the deeper levels you must traverse to, and how to do so with ease, in order to stop the undesired behavior and cure conflict. The Four Empowering Beliefs that will arm and invigorate you to strategically solve conflict on a remarkably powerful level that will prevent conflict from rearing its ugly head in the future. The Stone-Cold Truth About Emotions. Many people understand “emotions” all wrong. Knowing what emotions really are will make you a calm, cool and collected force in your workplace. You’ll be able to see directly into the “heart” of an issue, and swiftly solve that issue with both compassion and authority. Is It Really A Conflict? Learn how to guarantee you never make the critical mistake of confusing a conflict with a debate, because debates are healthy and good for both working and personal relationships. You’ll uncover the 5 key differences between a conflict and a debate, learn how to nurture positive debates and stop unhealthy conflicts. The 14 Causes Of Conflict. You’ll be shocked by how much easier resolving conflict becomes when you can instantly categorize the “type” of conflict. You’ll immediately know the factors agitating the conflict and the proper steps to resolving it quickly. The Reason Behind 60% - 70% Of Conflicts. This has to do with what motivates us internally that few people consciously realize and even fewer can articulate. Armed with this powerful knowledge there will be no conflict you can’t see the root of and solve in a matter that benefits you, your employees or coworkers, your business, and your life. The “Keys To The Kingdom”. Why people with identical values still get into conflicts, and how to resolve these types of conflicts in 3 simple yet actionable steps. This method of conflict resolution ensures that all parties are fully satisfied and that their greatest needs are met – a truly powerful system and highly desirable outcome you’ve got to check out. The Seven Words that will give you intimate knowledge of what’s truly inside the hearts and minds of your coworkers, employees, or those you with whom are in conflict. It is only with these words that you are guaranteed to better understand the situation and are guaranteed to find the most satisfying resolution for all parties involved. Solving Conflicting Beliefs. You probably already know that when two people have different beliefs, conflict seems inevitable, but it doesn’t have to be. It’s easier than you think to take positive action towards empowering beliefs that lead to harmony and resolved conflict, and I’ll show you exactly how to do it step-by-step. The Four Styles. Though people are endlessly variable, it’ll benefit you to have a clear understanding of the four main communication and working styles people tend to exhibit. They’re as follows: the controller, promoter, analyzer, and supporter. You’ll learn the primary objective each style tends to have, how each communicates, the natural alliances that tend to arise among the four, and the natural conflicts that tend to arise among the four. This will serve as your guiding light in the dark waters of conflict. Knowing someone’s type will instantly shed light on why they operate the way they do. This light, in turn, will immediately give you the tools you need to resolve conflict, communicate effectively, and even persuade others to your way of thinking. The Conflict Resolution Webinar will give you an in-depth crash course into all of the conflict solving skills you need to effectively communicate your point and, when necessary, persuade others to your way of thinking. It compiles my 30+ years of human-behavior training into less than one hour. You’ll learn virtually everything I know, without the years I spent in the trenches to learn it. This has only been released to a very limited number of my private clients, but it’s about time I released it to you. In this highly-praised “insight into the human mind” guide, you’ll uncover the reasons why you seem to naturally “get along so well” with some people, yet have more difficult relationships with others. The fog will be lifted and everything will not only “make sense,” but you’ll have the exact tools you need to influence and work effectively with anyone, even those people who you thought were most unbearable. The Relationship Puzzle retails for $19.95. Due to overwhelming demand from corporate clients to better understand how to effectively use e-mail, I finally buckled down and created the Email Dynamix Guide. Both profitable business relationships and steamy controversy can be created through Email, with neither party aware of what caused what. By better understanding effective and influential emailing, you’ll be able to foster stronger relationships and avoid conflict. We all know how useful and routine writing e-mails has become, but have you taken the time to consider when writing an e-mail is a poor course of action? This guide will reveal that, and offer alternative forms of communication (that go beyond a phone call). You’ll also discover why email and other forms of digital communication can go wrong. Then, you’ll learn how to effectively use email to your biggest advantage: to motivate others, persuade them, and get your points across with more ease than ever. 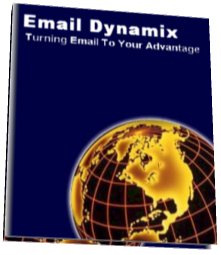 The Email Dynamix Guide retails for $19.95. That’s over $357 of guaranteed conflict squashing material, yours now for the low, one-time investment of $96. Don’t waste another minute of your time bickering with coworkers, or watching your coworkers bicker with one another, while you stand by without a clue how to handle it. Your career, your business, and your life are simply too important and time is too precious a commodity to waste. The benefits of a life and working environment without conflict are huge. Can you imagine actually waking up, and being excited about going to work? About meeting with colleagues who you may not always agree with, but who you can communicate with in a stress-free, productive manner that actually accomplishes goals and tasks, rather than puts them on the back burner for personal conflict? …All you have to do now is make the choice to end conflict in your life. What’s even better, is that I stand by the power of the Conflict Resolution Power Package with a lifetime, no-questions-asked, money back guarantee. I have used the strategies you’re about to access to enhance the work experience, productivity and lives of tens of thousands of individuals who suffered with the stresses of workplace conflict just like you are right now. To speak with you plainly, I know, beyond a shadow of a doubt, that they work to create harmony and will change your life and relationships for the better. That’s why I stand by my product with a no-questions-asked money back guarantee for life. 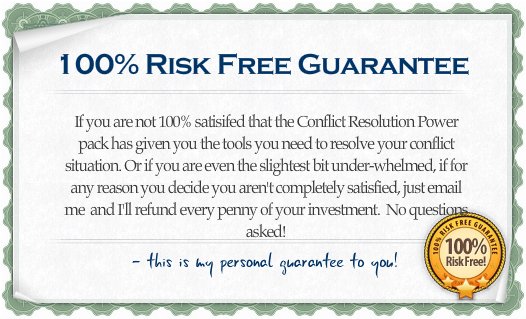 Satisfy your curiosity and get inside the Conflict Resolution Power Package right now and face absolutely no risk. Take action to improve your working life, and life in general, right now. It was a true pleasure to be a part of the class. I learned so much invaluable information that has done wonders for me and my team. Thank you very much for your time and priceless instruction. Keep me posted on your book! I know you’re ready to dramatically decrease your workplace stresses, and proper knowledge of effective, persuasive communication and conflict resolution is the guaranteed key to annihilating those stresses. The opportunity to instantly change how you communicate, to instantly be able to persuade with ease, and to instantly be able to stop conflict is here, right in front of you. I’m so excited to present you with this worthwhile opportunity today and know that you will live a life free of conflict from now on. Click “Download Now” to get immediate access to the Conflict Resolution Power Package, and transform your work experience into a day of productive, efficient problem-solving and money making. Then, go home without the excess baggage of workplace stress. You are ready for this new, stress-free reality, right? Get inside the Power Package right now. I’m ready to quickly master the art of effective communication and conflict resolution. That’s why I’m picking up the Conflict Resolution Power Package right now. I also understand that my investment in myself today is backed by an unconditional, lifetime, no-questions-asked money back guarantee.